New Zealand wants to boost cooperation with Ho Chi Minh City in various fields, including agriculture, technologies, food safety, aviation and human resource training, said New Zealand Ambassador to Vietnam Haike Manning. 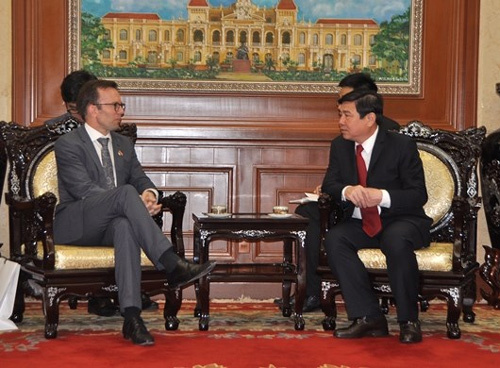 The diplomat made the statement during a meeting with Secretary of the municipal Party Committee Dinh La Thang in HCM City on May 5, reported Saigon Giai Phong Newspaper. Thang spoke highly of sound cooperation in many fields between Vietnam and New Zealand. Earlier, Ambassador Manning was received by Chairman of the municipal People’s Committee Nguyen Thanh Phong. A direct air route connecting the city and New Zealand’s Auckland will be opened on June 4. A New Zealand culture week will also take place in the city in June./.